Though I am writing this post to share my favorite therapy activities with fellow SLPs, I think many parents will find this post informative as well…parents can use some of these activities at home with their children to have fun bringing in the season! I LOVE using books in my therapy sessions. Usually I will read the book, and then do an activity based on the book. Depending on the needs of the children in the group (children working on language vs articulation vs fluency) the activity itself can be used as a language lesson or as a reinforcer for articulation drills. I also tell the parents what book we are using so they can read the same book at home if they wish. Check out my post HERE where I listed several of my favorite fall and Halloween books. Check out my post HEREwhere I went over activities you can do with my most favorite book, The Little Old Lady Who Was Not Afraid of Anything. Check back soon for my activities for two of my other favorite fall/Halloween books, There Was an Old Lady Who Swallowed a Bat, and There was an old Lady who Swallowed Some Leaves. Halloween or Autumn Bingo…I use these every year. For language kids, we will work on the vocabulary and then I will cater to each students individual needs. For example…if a child is working on “wh” questions, we will work on them using the vocabulary on the Bingo game. Working on syntax? Have them practice sentence formulation using these vocabulary words. Bingo can be used as a simple reinforcer for Artic drill also. And want to really motivate your students? Every month, towards the end, I have M&M Bingo Day. The kids LOVE this….rather than use regular bingo markers, the students use M&Ms to mark their places…and they get to eat them when we are done! (Tip: Keep a box of small zip lock bags….some kids like to take their M&Ms home). Where to get the bingo cards:I get mine at two different places. I downloaded, printed and laminated bingo cards from the Speaking of Speech Materials Exchange Page (This is the one my daughter is using in the pictures). I printed out an extra one to cut out the pictures….I then put those in my little “pic nic” basket (see picture above) and that is how I draw the bingo items. I then keep the little cards organized in a small 3×5 card holder-binder-gizmo (like my super professional title for that?) See it below. My other set of bingo cards use I actually print out at Crayola dot com. I like these because each child can color their own card while other children in the group are taking their turns, and then they can take it home (if they want). The only downfall is that if you have 55 students on your caseload…that is 55 copies. So…that is when the other set is nice to have. 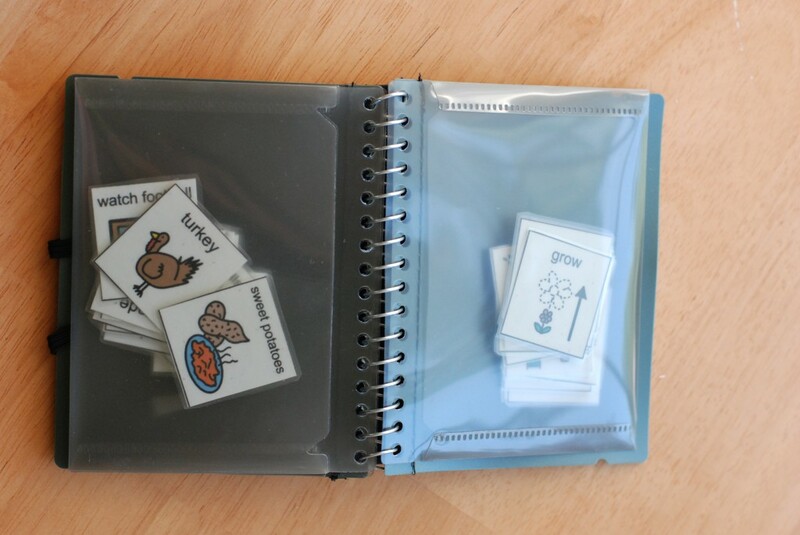 One of my favorite sites, DLTK Kids has this awesome Custom Dominos Maker where you pick your theme and it will generate a set of dominos that you can then print out, laminate, and use in therapy. 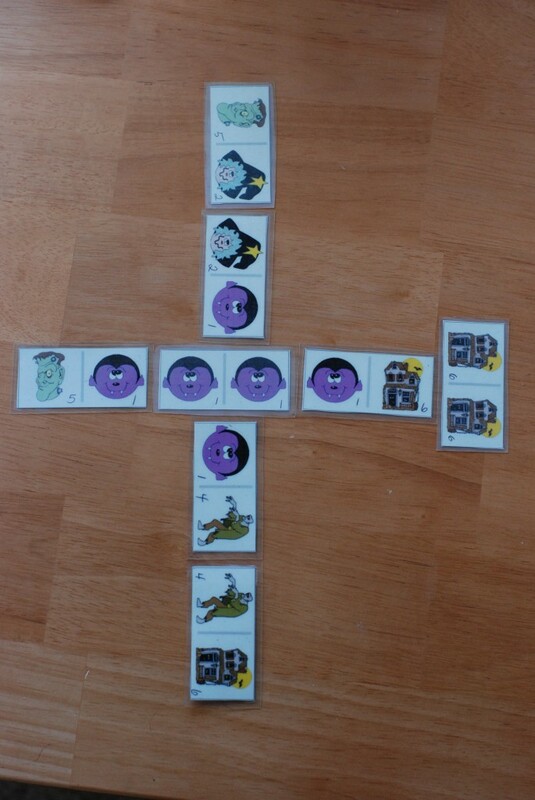 I have made the Halloween and Thanksgiving sets and used them last year with my Elementary kids (K-5th. They LOVED it. I added on numbers as I knew the older kids would enjoy keeping score. 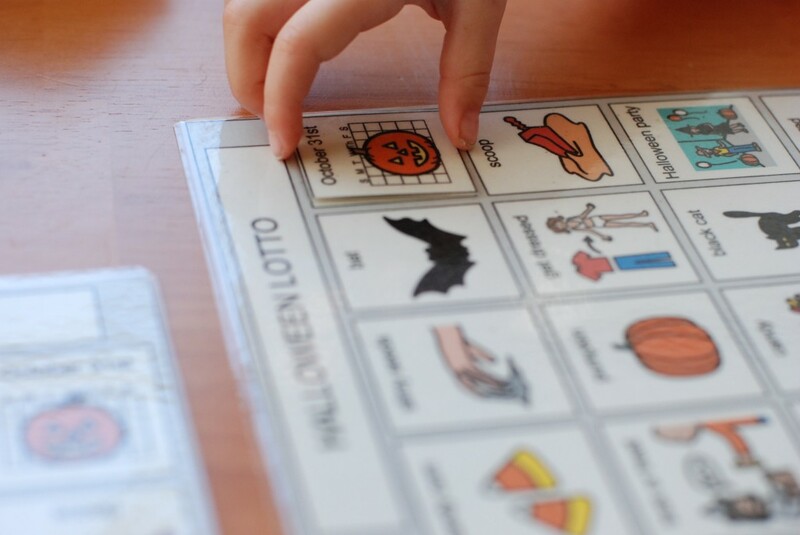 Just like Bingo, you can use the pictures to work on vocabulary, or just use the game as a reinforcer for other language/artic lessons and drills. I came across these cool cards last year at Preschool Printables. They were designed to be used as a file folder game, however I thought these adorable scarecrows would work awesome as a memory game. This memory game will help reinforce color recognition and memory skills while you are working on speech and language. A few years ago I was quite bored and wanted to start the year off with some new games to use in therapy. But, I didn’t have a lot to spend (sound familiar?). I ended up buying the book Year Round Literature for Language and Artic! from Super Duper Publications. This book has a ton of different simple games that can be used in therapy sessions. One of them is the Apple Game (pg. 11 & 15). 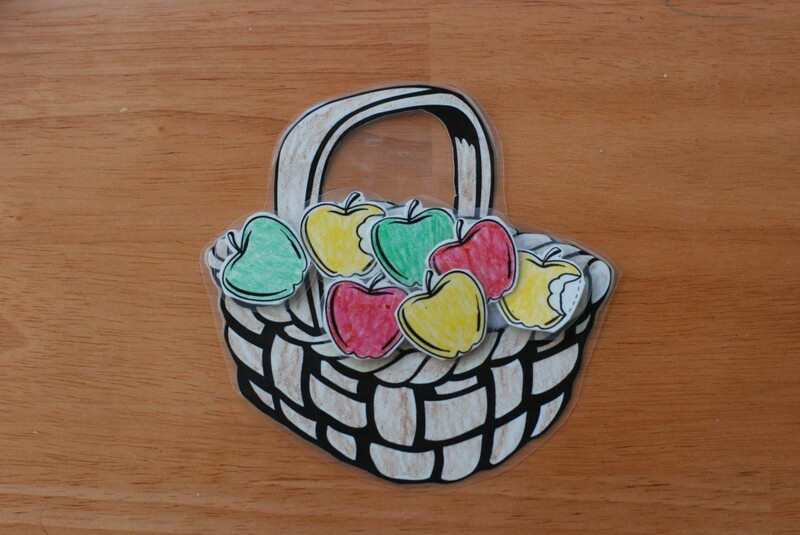 I printed out the baskets and apples, colored them, laminated, and used Velcro to attach the apples to the basket (the book came with a CD ROM! LOVE!). Little ones really loved “collecting” the apples in their baskets. 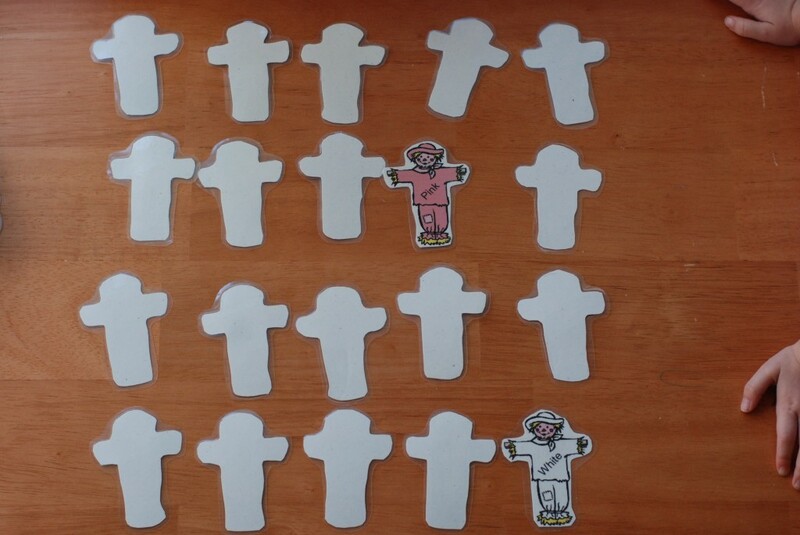 You could also print out individual pages for each child and have the children color and glue them. 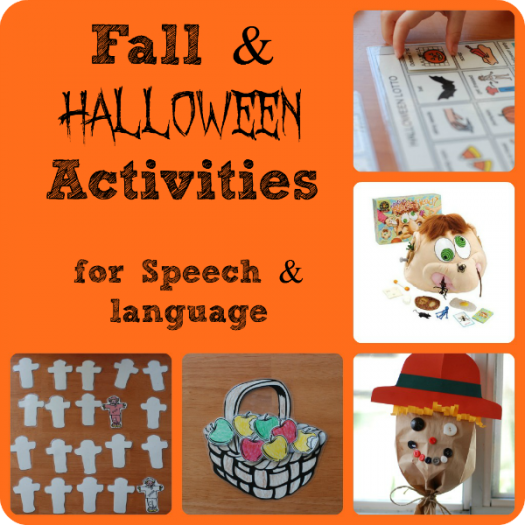 In addition to the Apple Game there are a few other Fall games in this book, that I will talk about in my upcoming post about Fall/Thanksgiving Speech Therapy Activities. I LOVE using crafts as part of therapy. I love using them to work on attributes, shapes, colors, following directions, giving directions, answering and asking questions, sequencing, etc. I also will use them as reinforcement for artic drill. 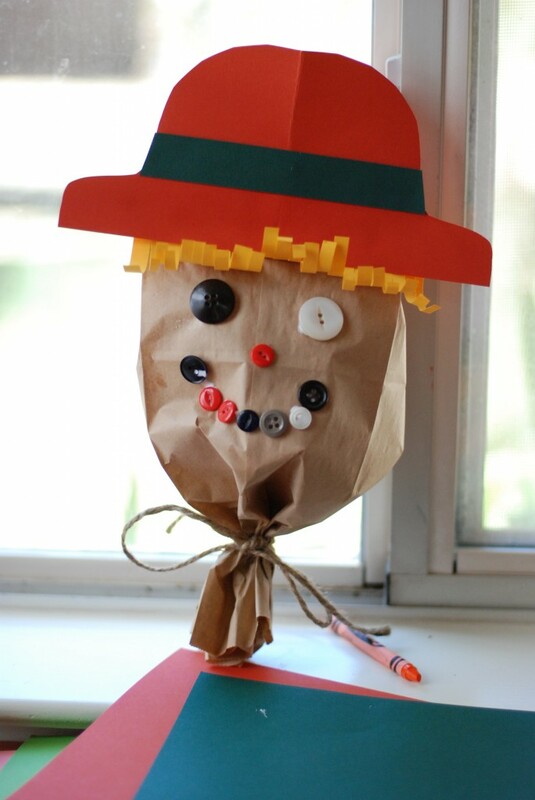 There are TONS of crafts out there in cyberspace that can be modified to use in therapy…My daughter and I just made this Mr. Scarecrow Head the other day…it was quite easy and fun. Some good sites to find ideas for crafts include Teach Preschool, No Time for Flash Cards, DLTK’s Printable Crafts for Kids, Fun Family Crafts, Craft Jr.
What’s in Ned’s Head? This is such a fun and yucky game! HA! Ned’s head is full of all kinds of gross things..and you have to put your hand in an orifice (nostril or ear) to fetch things out. Kids LOVE this game! I use it preschool through 5th grade. 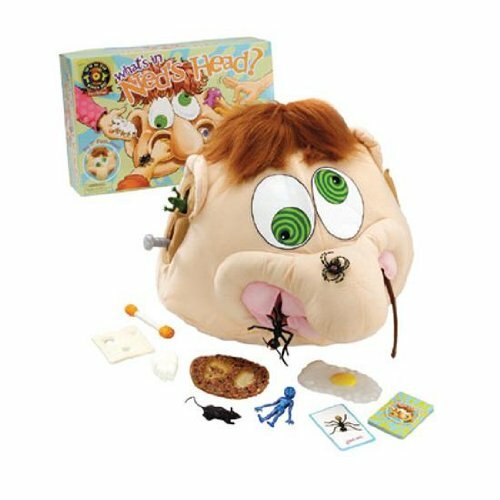 Monster Under the Bed: This game is made by the same people as Ned’s Head and is very similar. Rather than reaching into a man’s head, you reach under the bed to pull out yucky stuff. 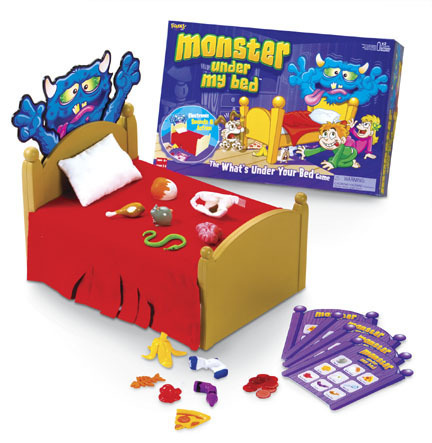 But watch out…there is a Monster under that bed that may jump out at any time! I use this for some of my 4 year olds and up (some kids LOVE it, other are a little scared so I test them out a little before I decide if we will play…sometimes I still play the game but turn it off so the monster will never actually jumps out). Whew!!! That was a LOT. I hope you all find it helpful…let me know by leaving a comment and let me know YOUR favorite Fall activity or craft!!! Congratulations on joining the blogging world! You’ve posted great information for everyone. Thanks Cindy! I’m sure you saw I linked up your site to mine 🙂 i love your blog, you have SO much info!! Thanks for stopping by! Great ideas and links! Something I like to do is order the Fall seasonal sticker scenes from Oriental Trading. The students use them to give directions and follow directions.They love it! It is a good language activity and artic. carry-over activity! These are great to involve family & friends too! Hi there! You have wonderful resources!! I am a school and clinic based SLP and waned to make the scarecrow with some of my self-contained and younger kiddos around Halloween! For those of us who are not so creatively “inclined” I was wondering if there was a template you used? Thank you for posting all these wonderful items!! I love these ideas for the fall! Looking forward to doing the apple basket game with my students!